Or the ‘sculpture’ of rhyme. American Medium is proud to release NEWAGEDEMANDED.COM. Inspired by Ezra Pound’s poem Hugh Selwyn Mauberly, in which a poet struggles to write in a philistine age, Jon Rafman’s New Age Demanded series expresses Rafman’s view that every age demands something new of its artists and the artist can be seen as screaming to express it. The artist must represent the impossible: the true character of the current age, but also its ceaseless passing into oblivion. The age demands new artists capable of taking up this challenge, of plunging into this simmering broth and emerging with new awareness, new languages and new rules. The ability of Rafman’s work to appeal to this call is what makes it so radical and potentially threatening. Rafman’s NAD project captures the accelerated movement of an instant. The forms of his sculptural pieces exist in time, and yet are still, frozen as if in the midst of a transformation. Like the repeated “no”s and “nots” in these lines of poetry, often the impossible can only be expressed through negation. The sculptures in this series are not human, not animal, not machine, not object. They are faceless and yet monumental. They are neither of the ancient nor of the hereafter. This evocation of both classical Greek busts and the covers to long lost sci-fi space operas results in an image that integrates conversations and clashes between past, present and future. The reference becomes almost invisible yet fully integrated, as the different works in the series can be seen to represent different individuals in different ages on different planets. Rafman takes the real to the virtual and then back to the real, bridging past and future, high and low, history and narration. 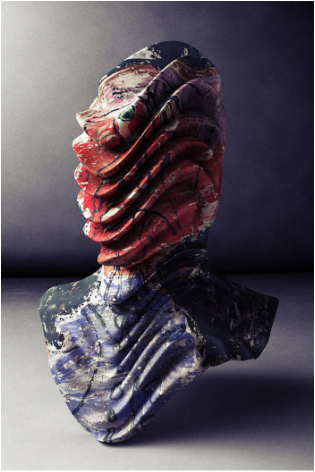 Employing 3D software, Rafman sculpts the “skin”—including paintings by Bruce Nauman, Francis Picabia, Robert Delaunay, Mark Rothko,—onto virtual busts. Rafman wraps the enigmatic forms in canonized modernist paintings, and so transmutes the two dimensional canvas into a three dimensional object, and back. In these busts actual art history meets possible futures in a topological space where reality is molded, stretched, bent, but never broken. Together, the series forms a conceptual literature of alternative realities, totally alien, and yet, somehow familiar.